I love having baths in my new bathroom with a view. I enjoy sitting with Galen at Roots while he has breakfast. We part ways and I venture off to the Meditation Center to check emails. But when I get there, Jason and Verena are sitting there talking with Pat. 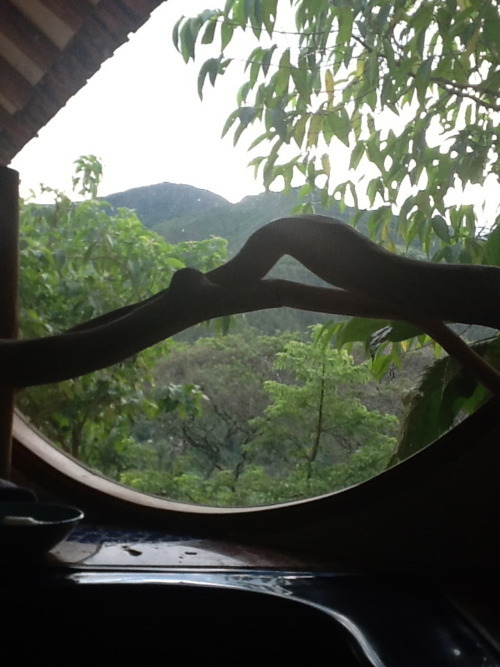 It’s wonderful to have them back in Vilcabamba. The reunion is brief because I am meeting Galen at the taxi stand to take a cab out to Karen’s place. I’ve got my new rubber boots and my Sarah shows up with string, flashlights and a new ring. Though more people were invited, it’s me and Galen off to Karen’s place. Karen’s place is a 10 minute walk from the road and on the crest of the mountain with a spectacular view of Malakasa. Wow! Karen greets us and we sit down to a mini feast for lunch. It’s off to explore the cave. It’s the reason we’ve come. There are rumors of caves that run all the way to Peru. I put on my rubber boots while Galen machete’s some grass covering the entrance. The concrete drainage in front branches into the caves entrance and continues along the length. We can see a soft glow about 300 feet in. Bats are flying in our direction and turn around. There is joking speculation that there a luminous being at the end or maybe a spaceship. Galen and Karen go in about half way and confirm there is daylight at the other end. Karen imbeds an amethyst crystal that Sarah Sherman had donated and which I had rubbed with Palo Santo. Putting the crystal there was to rebalance any unbalanced energy. We go back to Karen’s place for coffee and delightful conversation. It rains lightly. Galen and I catch a bus back to Vilcabamba. Jason, Veren, Ginna and I go to Shantaz for dinner before I go home.